UP Assistant Teacher Admit Card 2018 is confirm to conduct written exam for much awaited 68,500 Vacancies. The Exam Date of Primary Teacher, Urdu Teacher needs to be held from January 2018 but there is no issuance of Exam Date or Notification to apply online date of 68,500 Assistant Teacher Recruitment. UP 68500 Admit Card 2018:- From 24 May 2018 applicant can able to download admit card for 27 May written held between 10 Morning to 1 PM Evening. Objective type question from education field is important syllabus to read and BTC 1ST , 2ND semester paper you must from books. 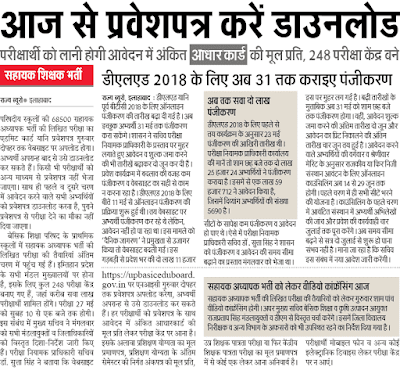 UP 68,500 Assistant Teacher Admit Card: Assistant Teacher in Hindi is also called sahayak Adhyapak and in upcoming year lots of events updated on upbasiceduboard.gov.in like when the Online application starts. 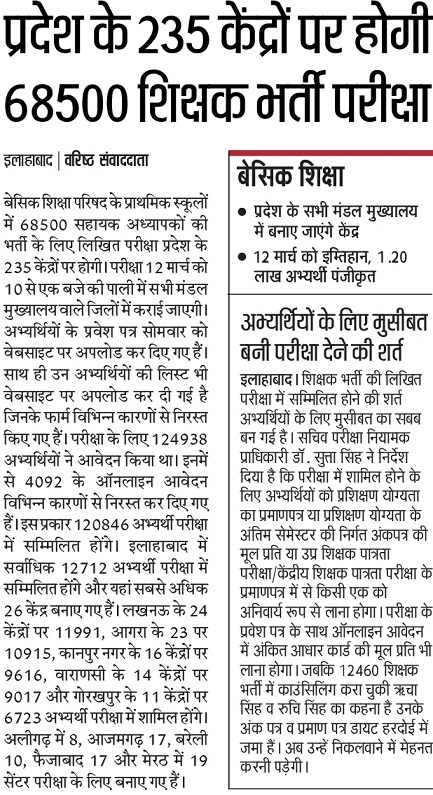 Many people still don’t know about pattern of primary teacher because of daily news updated by Hindi newspaper but today you can check our section on exam syllabus of UP Teacher. 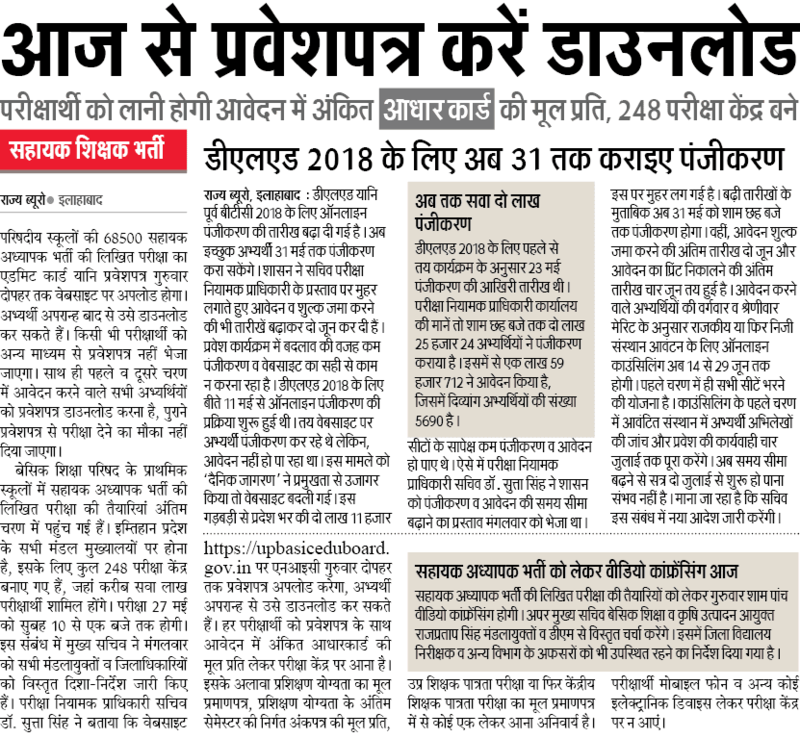 UP Primary Teacher Admit Card 2018: Latest News 24 May UP Government wants to conduct written examination after High court decision to remove 14 question from UPTET 2017. So decision will come before 12 March whether exam conducted or not. Total 235 exam center decided for 68,500 Teacher in Primary School. UP Basic Shiksha Parishad said Exam centres only made in Central School, ICSE Board, Rajkiya Inter College and CBSE Board. Exam Pattern: UP Assistant Teacher Exam syllabus mainly focus to Child Education from 1st to 10th class. If you have studied Pedagogy of education, Make Micro teaching files than it is not so hard to qualify written exam for UP Assistant Teacher Exam.